Are Paul Heyman and Brock Lesnar headed for a split? Look, we all saw events unfold on RAW this week. In the final segment of the show, Brock Lesnar destroyed RAW General Manager and his former adversary, Kurt Angle. Then he (almost) assaulted Paul Heyman, pushing him to the ground where Angle lay. It seems quite clear that the two men are headed towards a split soon. Lesnar may venture to the UFC to test his prowess against the best fighters in the entire world. And that leaves Heyman all high and dry. It also creates an opportunity for a brand new Paul Heyman guy (or Paul Heyman girl!). Follow Sportskeeda for the latest WWE news, rumors and all other wrestling news. 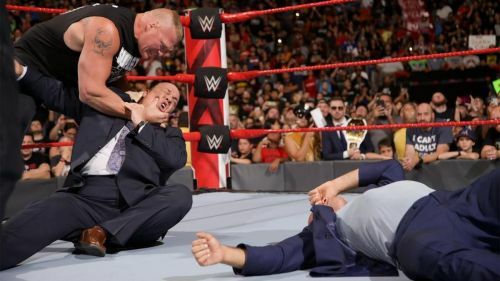 Paul Heyman has been associated with some of the greatest of all time, from Steve Austin, to The Undertaker, to CM Punk, and of course, Brock Lesnar. He has a Midas touch and can elevate almost anyone to the very next level. These five superstars could certainly benefit from his wisdom and profound expertise. Asuka needs a mouthpiece and she needs it fast! How far down the ranks has Asuka fallen since she lost to Charlotte Flair at WrestleMania this year? The same woman who was undefeated in NXT has been reduced to a sideshow character on SmackDown Live, while Carmella rules the roost. An association with Paul Heyman could help her overcome her weakest area- her promo skills. Asuka is not a native English speaker and therefore her promos often leave the WWE Universe confused and rather underwhelmed. Paul Heyman may be the greatest orator in WWE history, who could significantly assist Asuka in rising to the next level. With Evolution on the horizon, this could definitely bode well for Asuka over the long haul. It would also be fresh to see Paul Heyman aligned with a female WWE superstar. Heyman has mentioned in the past that he certainly would not be opposed to this.